Food Contact Materials (FCMs) cover a variety of materials and articles that come in contact with food during its lifetime, from food manufacturing through to preparation in our own kitchens. Food contact materials can be constructed from a variety of materials such as plastics, rubber, paper, coatings, metals etc. The interest in food contact material’s testing is driven globally by developing regulations, which ensure traceability and consumer protection. These regulations ensure that any material or article intended to come in contact with food is safe for its intended use. In other words, it must not transfer components or cause changes to the foods that may impact consumers’ health. FCM testing is typically conducted on the finished product, in accordance with exposure temperature, time, and migration experiments detailed in the legislation of different countries and/or regions. 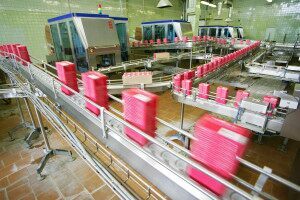 Migration of chemicals contained in food packaging materials can introduce its own set of complex analytical challenges. Food packaging manufacturers rarely provide a complete list of all the additives present in the formulation used in their packaging. The original formulation can also degrade or undergo chemical changes during the manufacturing process; so there may be additional contaminants that the packaging manufacturer is not even aware of. Therefore, the choice of chromatographic technique and extraction method is important to ensure proper detection of all relevant compounds. Waters’ mass spectrometry provides the ultimate platform for specific migration studies and non-targeted analysis of materials intended to come in contact with food. Whether coupled with UltraPerformance Liquid Chromatography (UPLC) or Atmospheric Pressure Gas Chromatography (APGC), mass spectrometry offers robust, sensitive, and accessible techniques for the identification and quantification of organic migrants in compliance with regulatory testing.